This is what the Masters call their world. 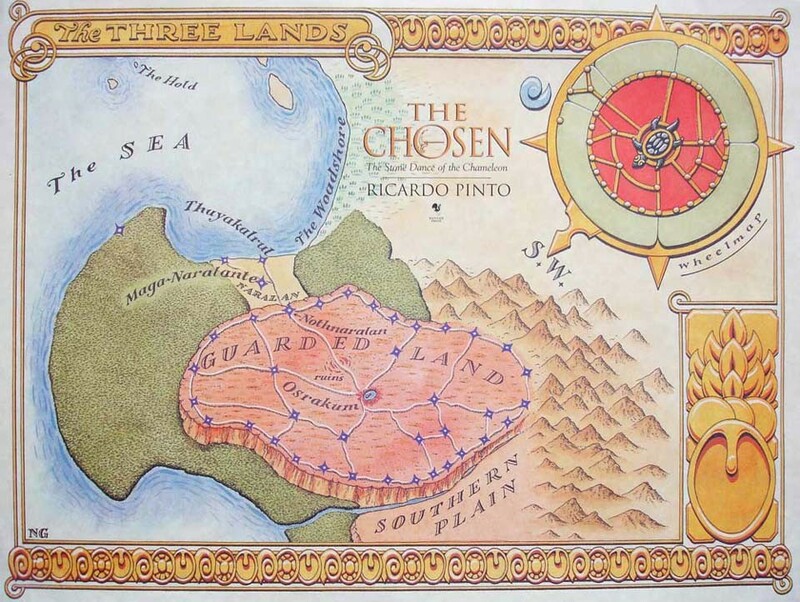 The three Lands are, in order of importance, Osrakum (also known as the Black Land), the Guarded Land (also known as the Red Land) and the barbarian lands which lie around the Guarded Land (and that are known, collectively, as the Green Land). The Earthsky is one of the ‘barbarian’ lands that form part of the Masters’ Green Land. The Commonwealth consists of Osrakum, the Guarded Land and the Naralan – a land corridor linking the Guarded Land to the sea. The Hold on Suth Sardian’s island of exile, is shown at the top left of the map. A wheelmap in the form of a compass rose is shown at the top right.